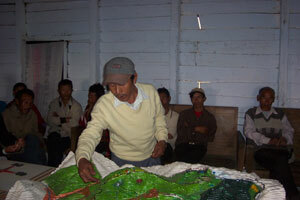 In 2006 a series of 1:5,000-scale models were done in the villages of Ngainga, Hundung Godah, Soraphung, Talui and Shirui Kashong range/ cluster, Ukhrul District, India. The project which made use of P3DM was a joint initiative of the Government of India (GoI) and the International Fund for Agricultural Development (IFAD). The North Eastern Council (NEC) and the Ministry of Development of North Eastern Region (DoNER) represented the Government of India in the Project set-up. The United Nations Office for Project Services (UNOPS) located in Bangkok was the cooperating institution for project supervision in implementation. The project staff of NERCORMP were trained on P3DM for twelve days by the Philippine Association for Intercultural Development (PAFID) from the Philippines. According to the project implementers, land tenure was extremely complex in the area. The traditional clan controlled-system, which secured subsistence cultivation rights and access to forest produce, was rapidly eroding. The uncertainty of long-term access to land, or the ownership status, was one of the major limiting factors when a farmer or a community made decisions on land use and on longer-term investments. Participatory 3-Dimensional Modelling (P3DM) practice was introduced to the Ukhrul District Community Resource Management Society (UDCRMS), a project unit of the North Eastern Region Community Resource Management Project (NERCORMP), a joint project of the Government of India (NEC/Ministry of DoNER) and the International Fund for Agricultural Development (IFAD). In order to capture the experience of the P3DM in land use management in Ukhrul district, Knowledge Networking for Rural Development in Asia/ Pacific Region (ENRAP) together with NERCORMP conducted a systematization process of documentation in 2006. The general objective was to answer the basic question on how P3DM had been used in land use management in villages where it was deloyed. The Systematization Documentation Team (SDT) composed of four persons, visited the villages of Ngainga and Hundung Godah. Based on the primary and secondary data/information gathered, the team observed that overall, the P3DM has brought changes to these communities among others, deeper understanding of their village geography, improved village communication and planning capacity, improved land use management, stronger community cohesion, and better access to basic services from line departments. The benefits derived from the P3DM according to the people, outweigh the cost and effort put into the construction of the model. It was further observed that land use, especially the enforcement of policies to ensure judicious use of natural resources, was effectively carried out with the participation of the people at the village in cooperation with villages at the cluster level together with the active involvement of concerned government line departments. Based on the interaction with the villagers, the team clearly observed that the P3DM can guide the communities towards strategic land use. The villagers have taken a strong sense of ownership of the P3DM. The good experience on P3DM has also reached other project villages. They requested the project staff to assist them to construct a P3DM. There were also non-project villages that requested the project to provide them with training and help them construct a P3DM in their villages. They expressed willingness to shoulder the cost to be incurred in the construction of the model. Unless the project takes a more comprehensive perspective on the value of P3DM in land use management and continually equip the staff and the community with the required technical capability to handle P3DM, additional construction of P3DM will not be fully optimized. The challenge now is how to make P3DM a dynamic approach in land use management. 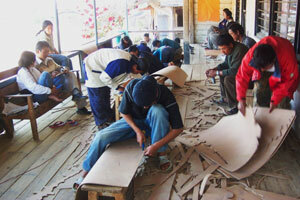 How it can be nurtured to continually contribute to the development of the villages even after Project life.